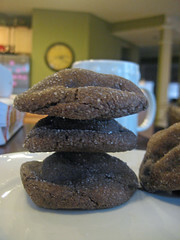 So, normally I am a few cookies short when the final count is done. Ah, well who really is counting? For some reason, I have this idea that if the cookie isn’t baked then the calories don’t count. (this thought also encompasses brownie and cake batter) Ha! In my dream world maybe. In my previous post of cookies, I listed things I loved about chocolate chip cookies ( all of which implies to most cookies). I would like to add one more thing to that ever growing list. I love how cookies are a tasty substitute for Thank You notes. * if you have ever received cookies from me for no real apparent reason, assume you probably deserved a heartfelt Thank You note, but since I am not one for remembering notes, stamps, envelopes, etc… and more apt to have flour, sugar, and butter in the house …cookies it is * So this batch is sent out to Earl and Theresa for their generous gift of Harley paraphernalia! For the amount of awesomeness that I received, I should have made a double batch! 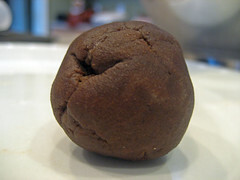 This cookie is a favorite among many and came to me from a great friend. 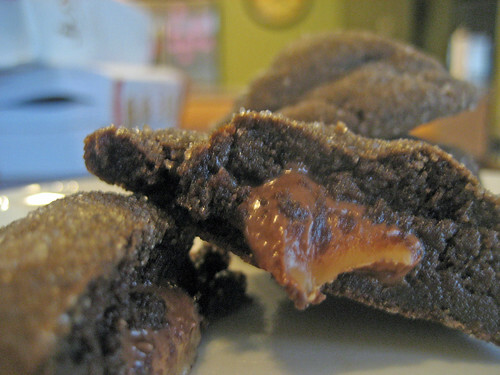 If you Google search Rolo Cookies, a recipe similar to this one pops up a many of times, so I don’t know who to give the original credit to…ah, well – whoever it is though, I thank them! This cookie is fudgy and rich with a nice surprise of caramel in the middle. What more could you ask for in a cookie!?! Take note of directions I give when the cookies are removed from the oven. 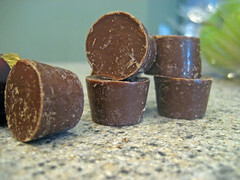 Refrigerating them will ensure that the Rolo candy doesn’t fall out of the cookie when you try to remove them from the tray. You want a cookie not a doughnut! 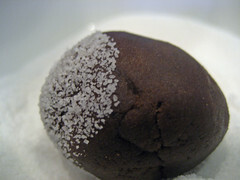 Sift together flour, cocoa powder, salt, and baking soda in medium sized bowl and set aside. Add eggs one at a time, allow the first one to be well incorporated before adding the second one. 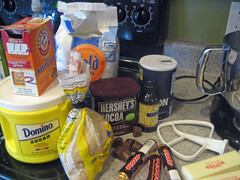 Slowly add the flour/cocoa mixture to the butter mixture and blend until well mixed. Remember to scrape the sides and bottom of bowl to ensure a homogeneous mixture. Place in refrigerator for at least 15-30 minutes (or overnight) so they are easier to roll. 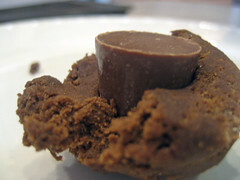 Push the rolo candy through the bottom of the dough ball, completely enclosing it. Bake for about 8 minutes. Once removed from oven, place tray in the refrigerator for about 8-12 minutes before transferring them to a wire rack. (Use 2 baking sheets and just alternate them from fridge to oven.) If you try to remove the cookies from the tray without quickly cooling them, the caramel has a tendency to fall out of the cookie or stick to the tray. If you try to cool them on the tray outside of refrigerator then the cookie becomes over baked because tray remains hot and continues to bake the cookie….JUST REFRIGERATE!!! Enjoy with a big glass of milk or a nice cup of coffee.